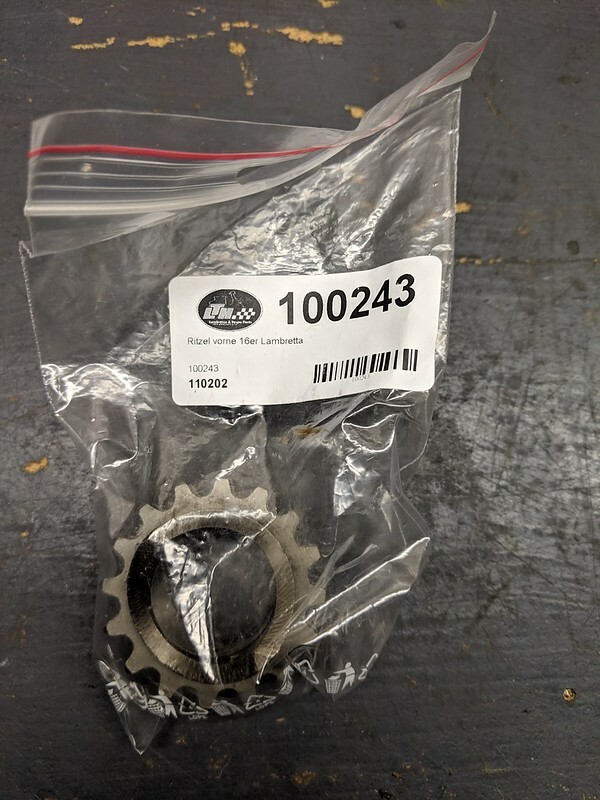 A true .003 clearance is going to give a ring gap of .009423...Pi theory. 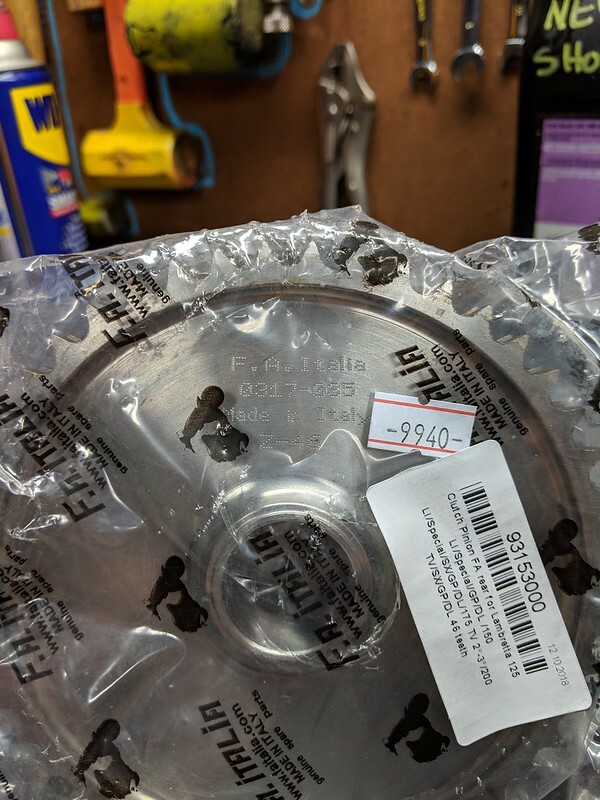 .009423... ring gap is what you want, or .0010 if you want to get all technical? It'll prolly run as it's honed, with new rings , but she's going to rattle. Ring's aren't going to seal 100%, barrel is scored. But it will run. I'm not following you on this due to a lack of experience and knowledge on my part. Is there a thread or sight that I can visit which will help me understand? I measured my ring gap, as seen in the photos above. It looks like they are at .018" or .45mm. Your message does not mention INCHES or MM, but I'm assuming it is Inches. You're saying that .0010" is ideal. So If mine is at .018 then I'm way to far out. 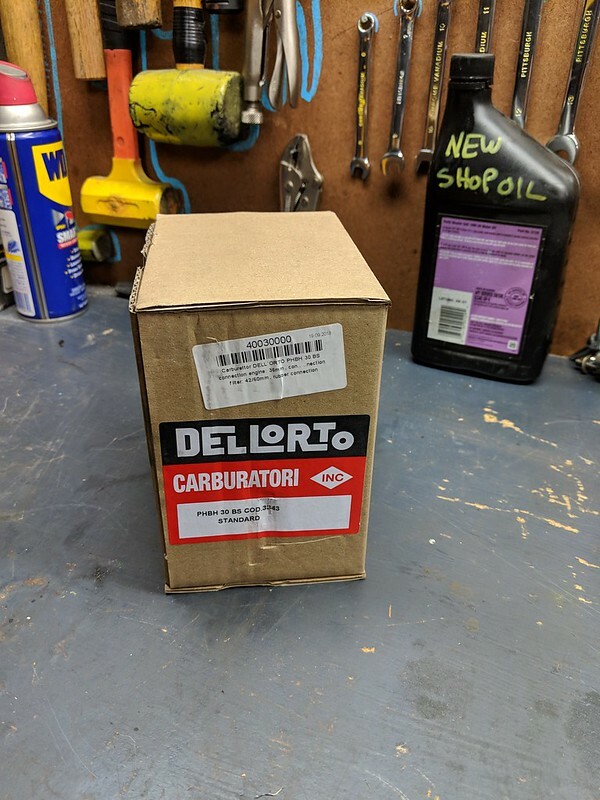 When I buy a new piston and rings I'll be stuck with the rings they provide, right? What if those rings are too widely gaped too? Can I get larger dia. rings? And if so, how do I know what their resting size is VS their compressed (into the cylinder) size will be? Sorry for my ignorance. This is how I learn. Much Appreciated. 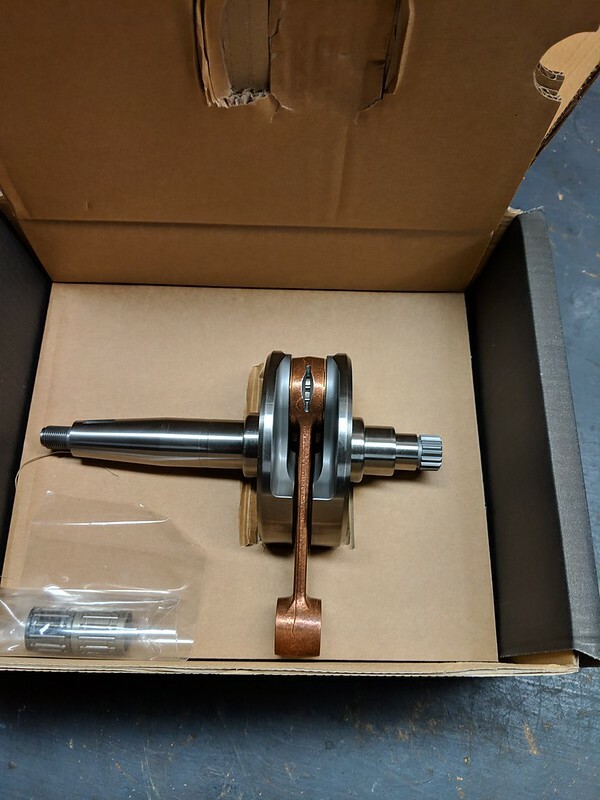 Here are some photos of the barrel and the crankshaft / connecting rod. Please let me know if you think the barrel is normal length or cut down. 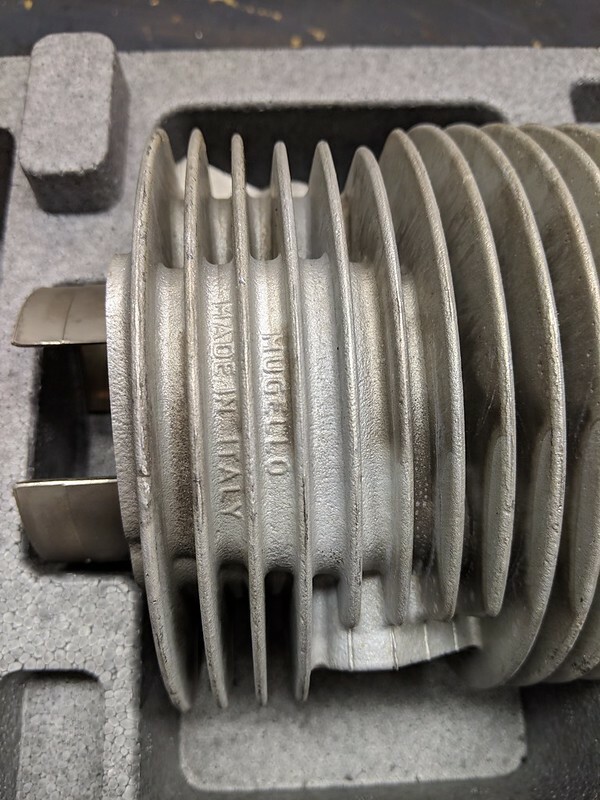 and please let me know if you think my connecting rod is actually 107mm. If there are other angles or sides of the barrel that you need to see, please let me know. I have no clue what they would have cut or how they would have cut it. Thank you. I did not find any writing on either end of the crankshaft. 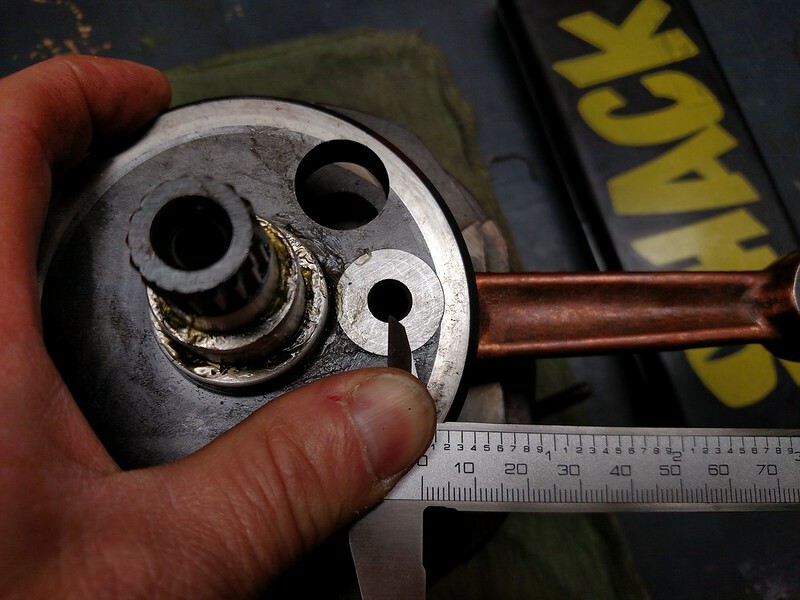 I measured from the center of each of the holes on the connecting rod. It reads 107mm. 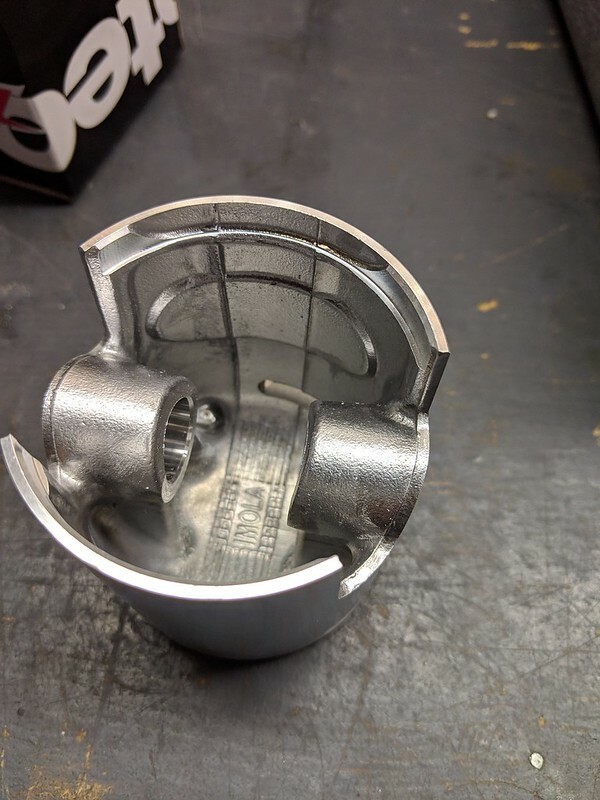 But I was under the impression that if my barrel is uncut then my connecting rod must be longer than stock. 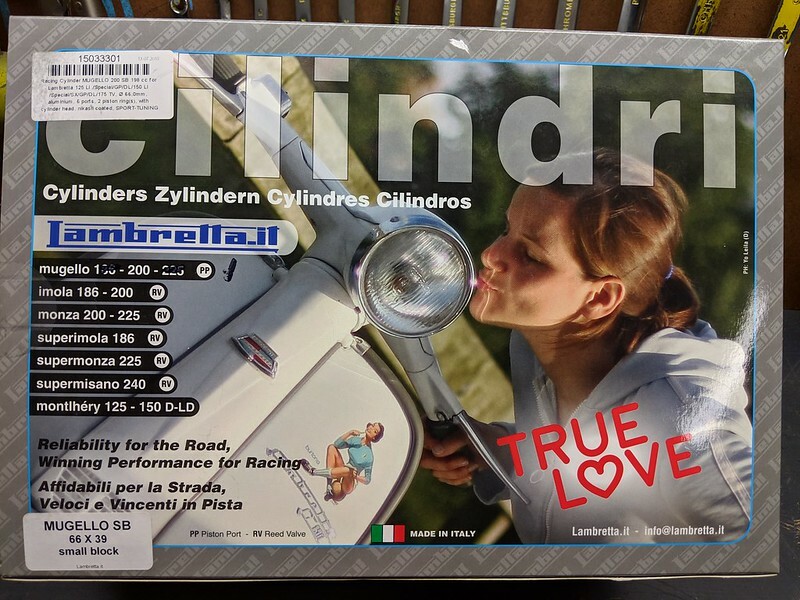 If this barrel is a WCLW 190cc. 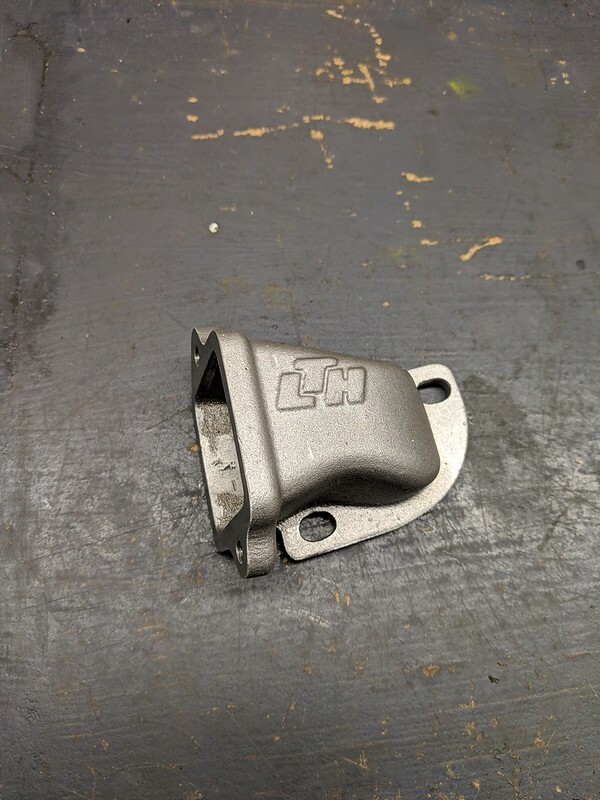 Then I would need longer than stock connecting rod. 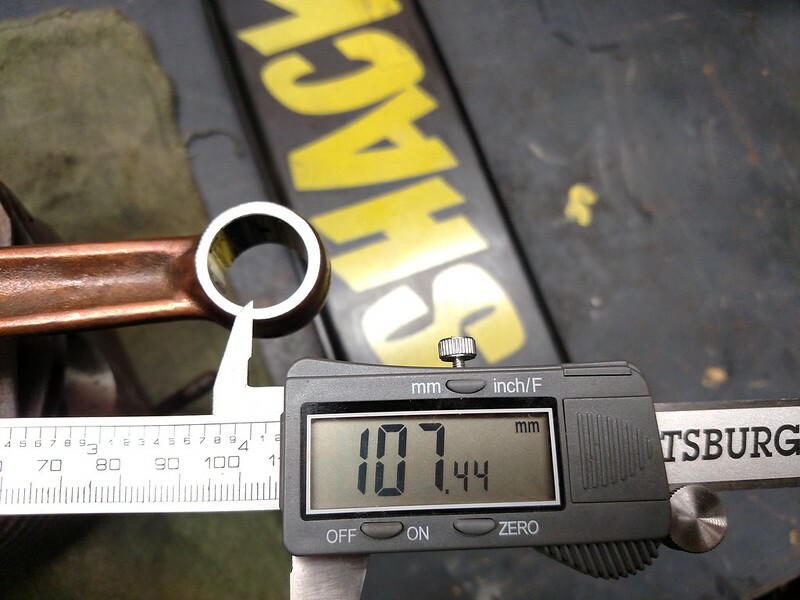 I believe that 107mm is the stock length connecting rod. If there are any other photos that will help identify what I have, please let me know. 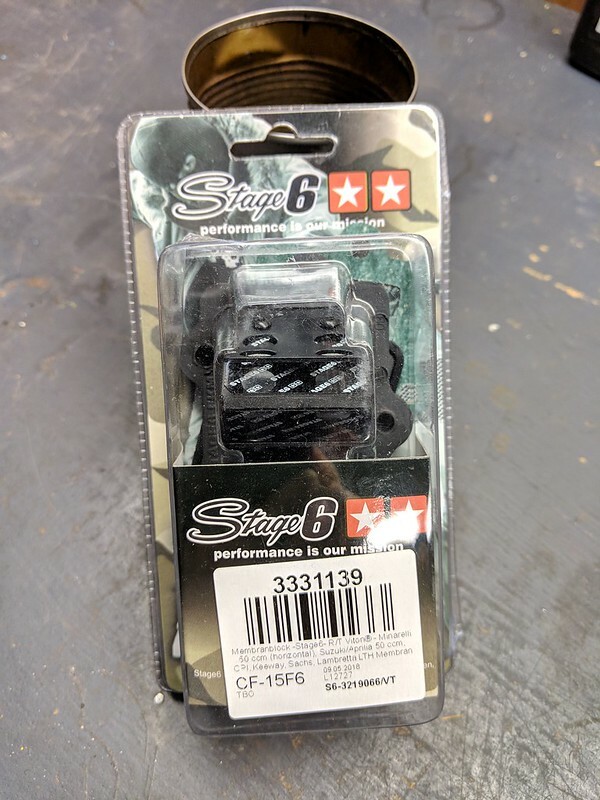 I'm at the point where Id like to begin purchasing parts, but I dont want to just shoot from the hip. Your assistance, expertise and history with these machines is what I'm looking for. 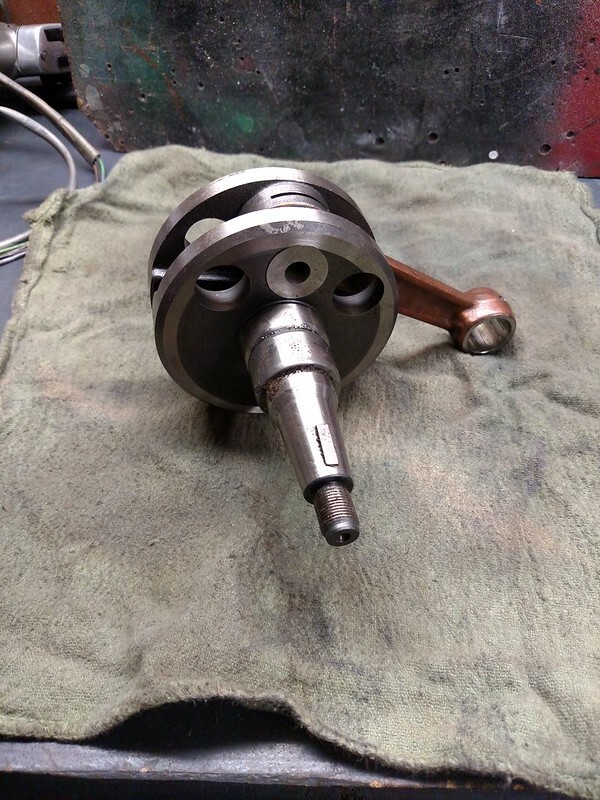 Correct, you have a shortened cylinder with a stock LI/SX taper crank (58/107). It was super common in the 80's-90's but not so much now with the advent of alloy kits and all the good cast iron cylinders drying up. Technically speaking it's a Suzuki 190 build. 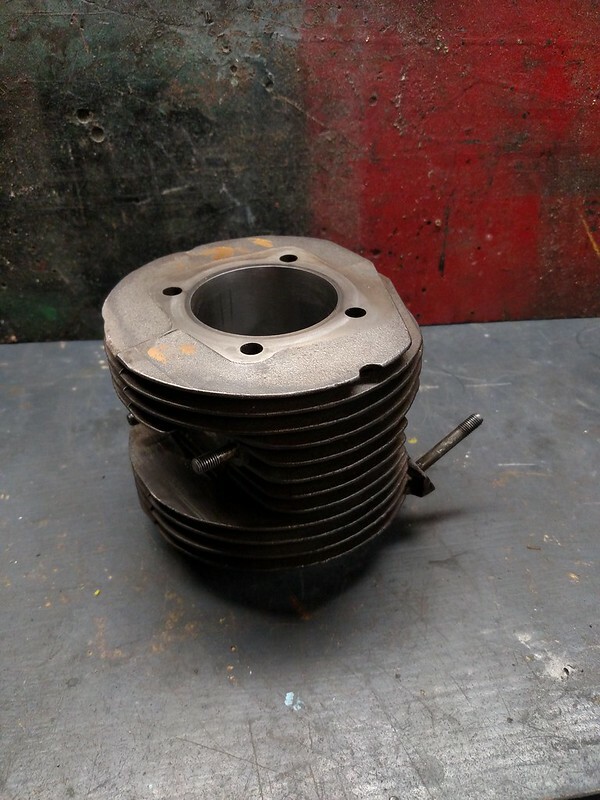 It uses a Suzuki (or equivalent) 64mm piston and the cylinder is "topped and tailed" to work with it. 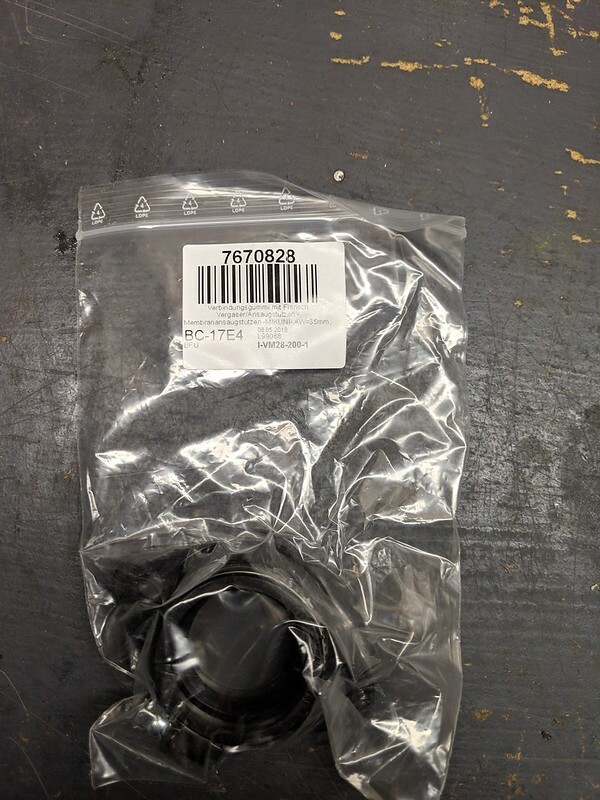 If you purchase a replacement TS185 piston, make sure it’s the later ‘ER’ type (such as 12110-29900) unless you like relocating piston ring pegs (I speak from experience). 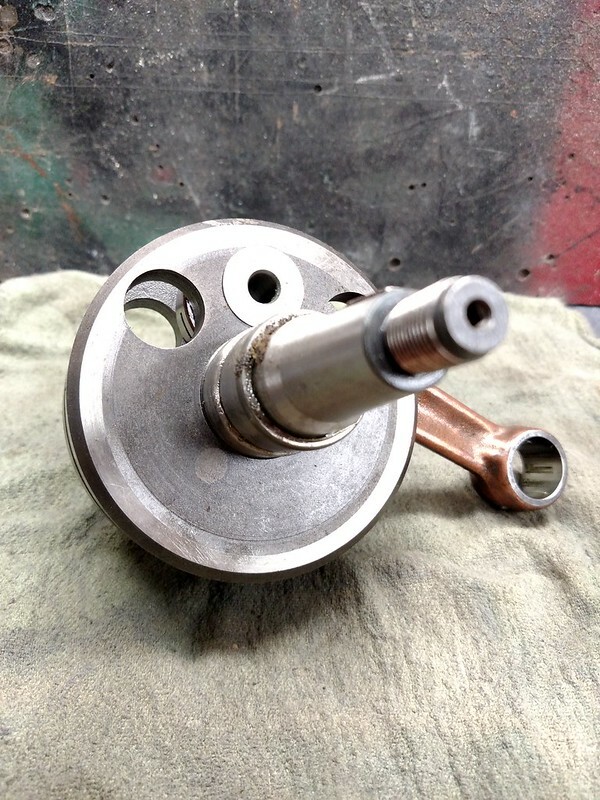 Its been noted above, and too late now, but my preferred method for this conversion is to use either an RD400 (115mm) or a TV175 (116mm) con-rod as it eliminates the need to machine the barrel, not to mention the benefits of a longer con-rod. OK, Mike, thank you for confirming this for me. 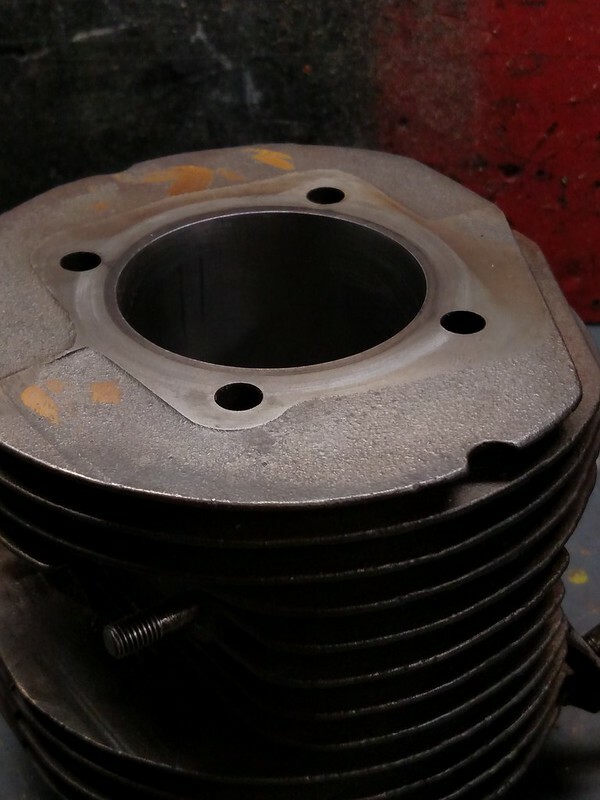 Can you tell me where they actually cut this cylinder? I dont know what a stock one looks like, so to my eye, this thing looks normal to me. I'll look for the ER type. Perhaps, at a later date, I'll replace this cylinder completely. When I do that I'll do the modern method and go with a longer con-rod set up. You'd better believe that i'm jotting all of this data in my future play book. Thanks again. The top and bottom have been turned down. Sorry I'm late! I didn't know we were talking about piston conversions!! Ha. I still do a bunch of iron barrel 186cc tunes. 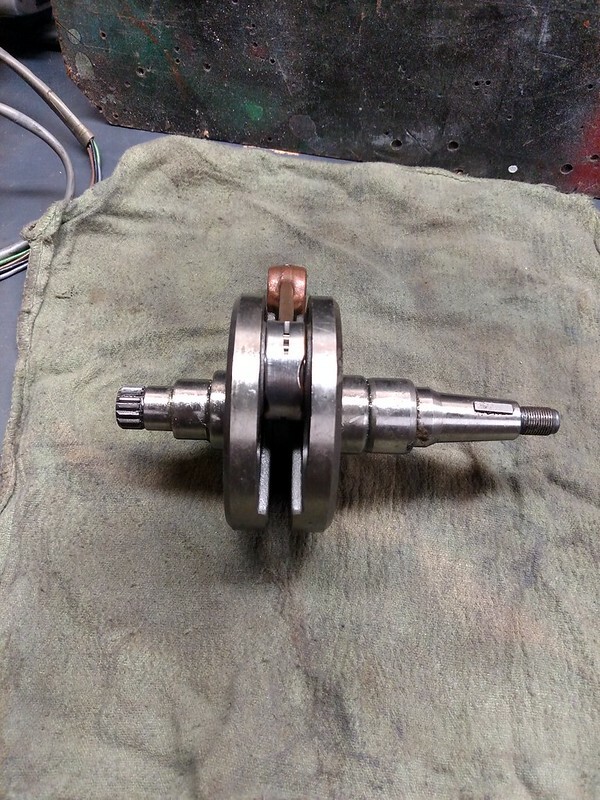 I prefer not to shorten the cylinders these days, but its still a good option if you want to avoid the cost of a crank rebuild. 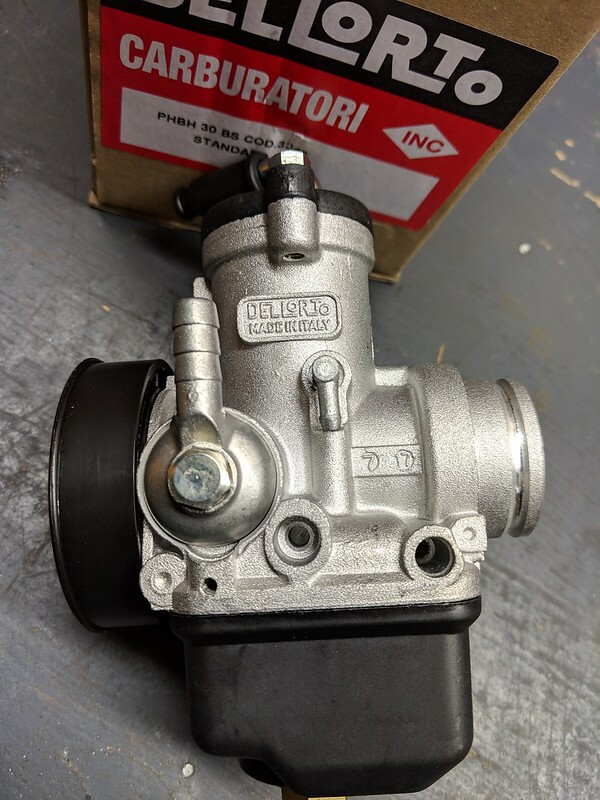 That's definitely a 107 mazzuchelli rod rebuild, Wiseco Ts185 piston (they don't differentiate an ER type), and shortened barrel. 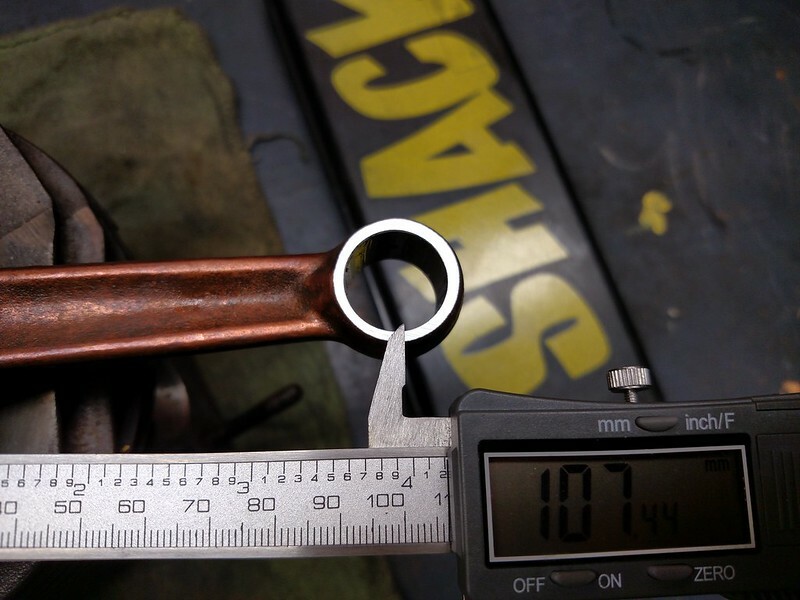 Wiseco rings tend to be a larger gap than one might expect, so anything less than 0.020" out of the box is ok, although 0.010" is optimal. 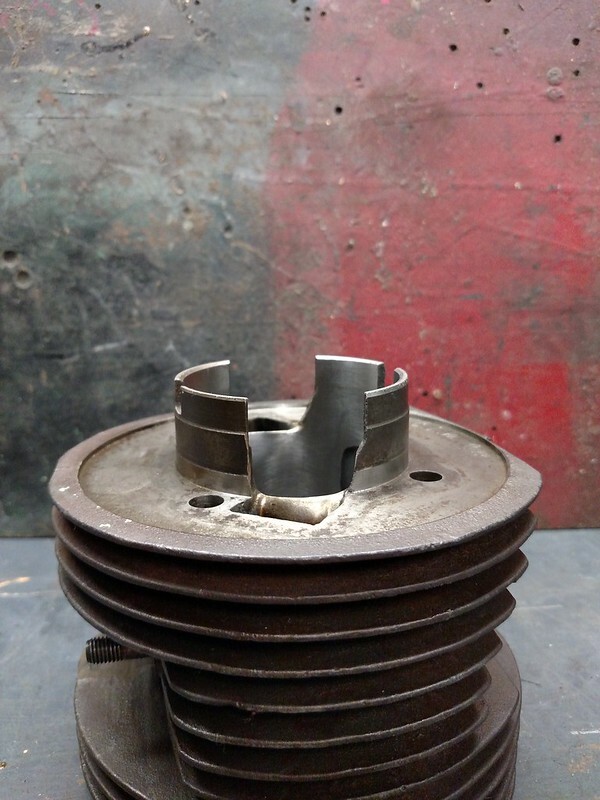 The only way to measure bore clearance is with a proper bore gauge. 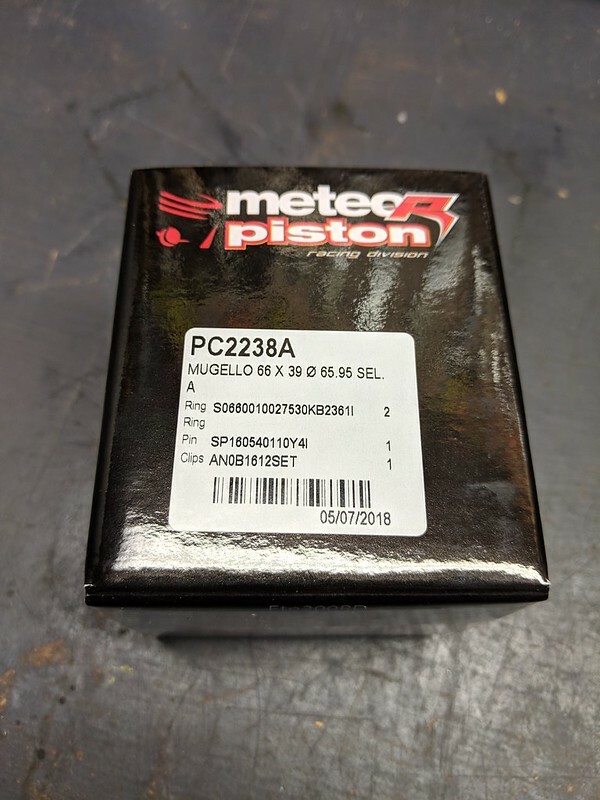 I measure barrels for free (plus shipping of course) and check con rod/big end wear for free as well, but regardless, if you need a new piston, that's an older wiseco number. The new number is 176M06400. 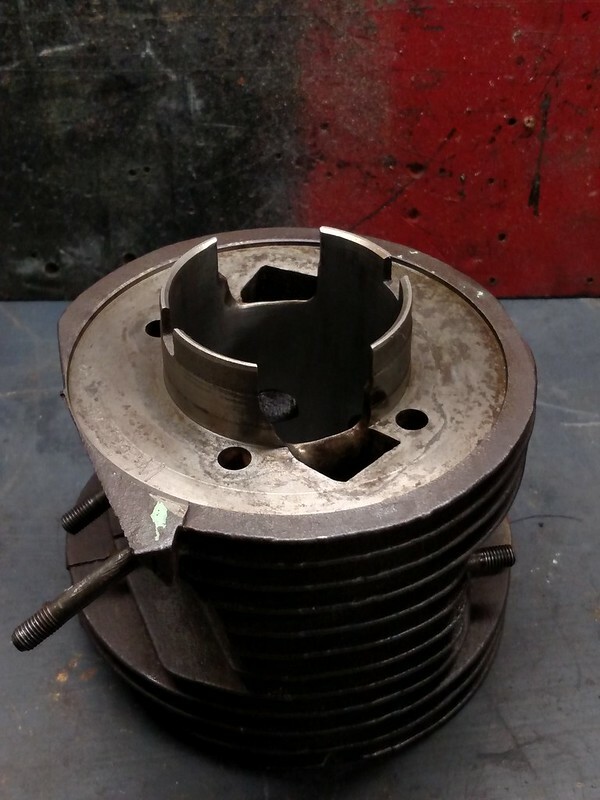 If you suspect you need a rebore, you could use a local bore/machine shop...then buy a 176M06450 and have them bore it to 0.0035", no less! 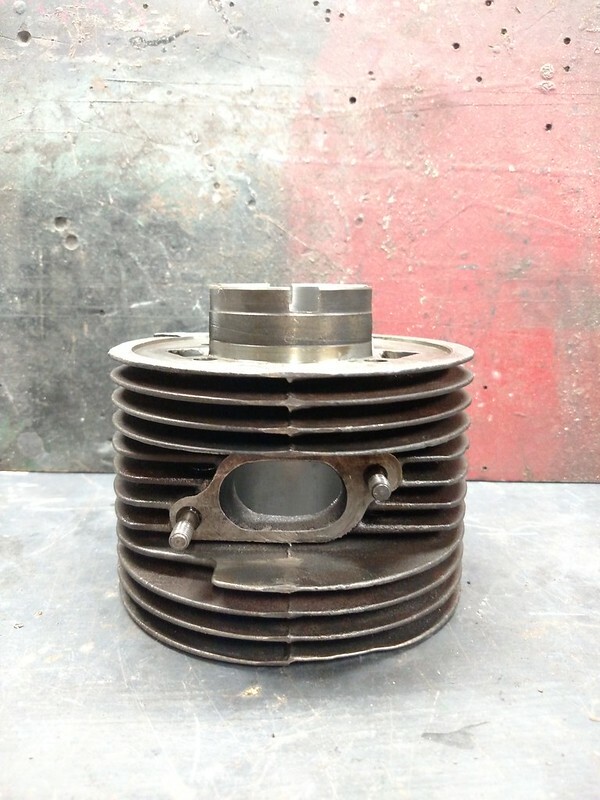 Although for this one you also need to shorten the piston skirt. 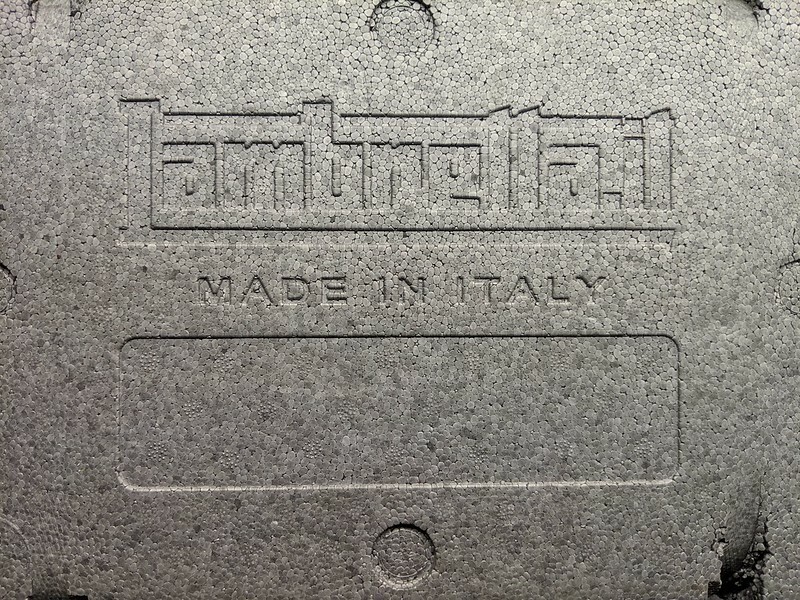 The generally accepted amount is to take 8mm from the skirt, although I think I've gone as little as 6.5mm to keep intake timing more reasonable (If I'm not doing it, tell them 7mm). I sell them for $110 standard, shortened I could do $125. Also, that barrel isn't ported much, if at all. These can be great kits for short money if set up well. 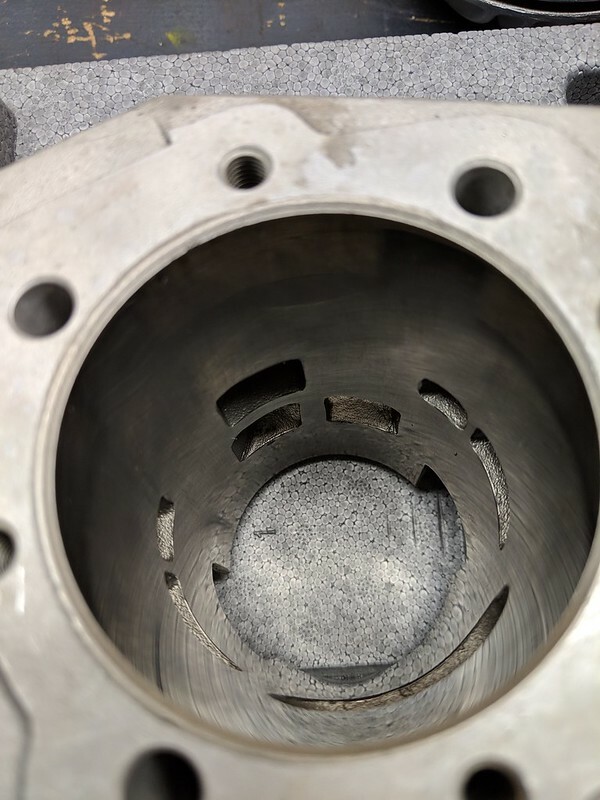 The head/combustion chamber should be checked too, to make sure it's not too high of a compression ratio...I've made that mistake myself in the past! It comes from recutting at too shallow of an angle and not opening up the chamber to compensate. Gotcha. Thanks for the link. I can see what was done now. Hey Solerunner1. Thanks for your info. 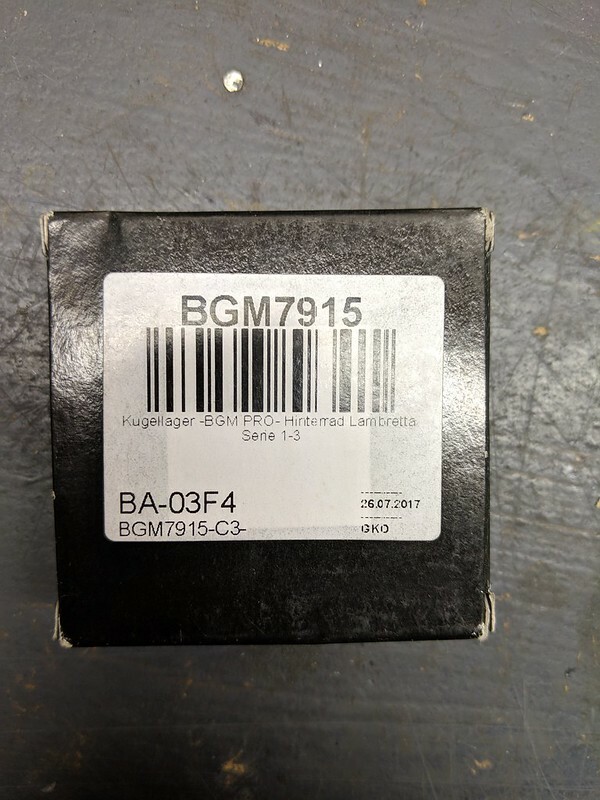 I've updated my part number on the piston. Thanks for the con rod info & ring gap too. I might take you up on your services in a later build. 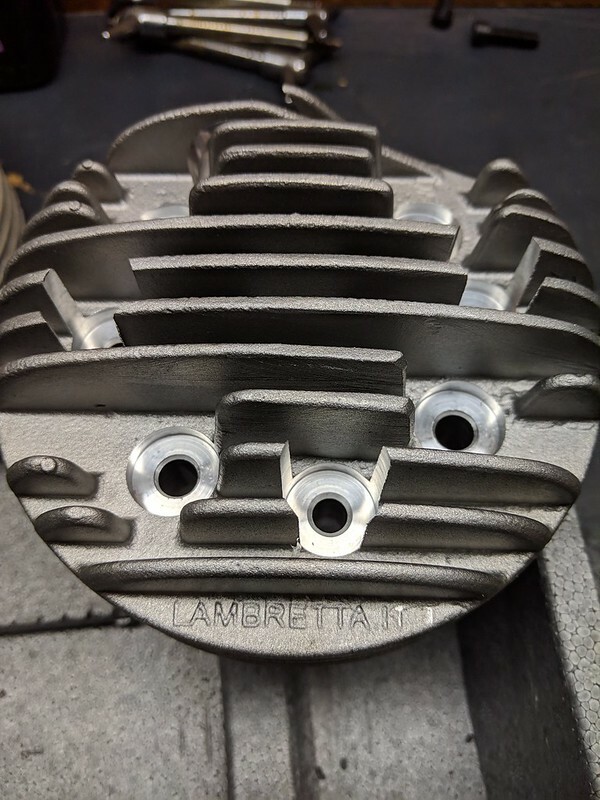 Do you have any pics or links to examples of good ported heads? Thanks for your info. Its all seeping into my mind slowly. Santa arrived a bit early this year. Luckly I had some highly qualified assistance to help me write my letter to Santa. 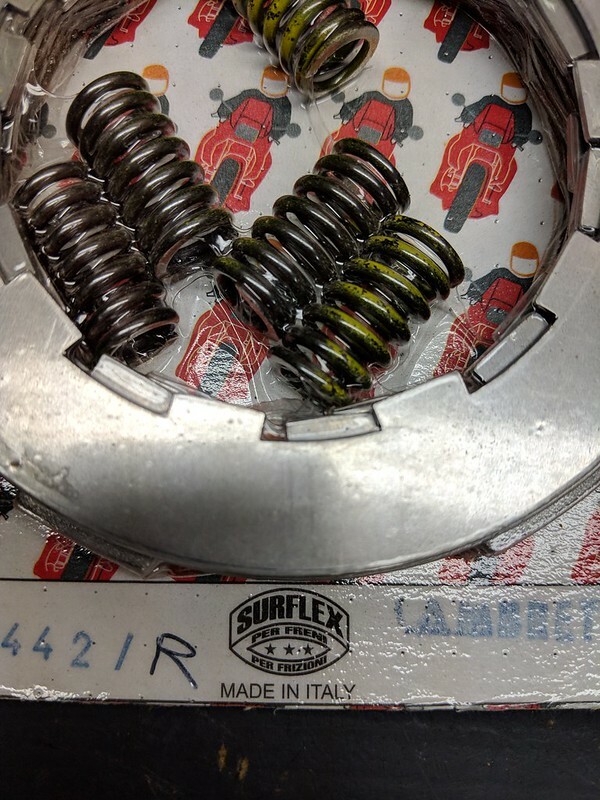 I spoke to our local area scooter parts supplier, Patrick of PTown Scooters. I asked him to help me piece together a list of parts for my motor build. 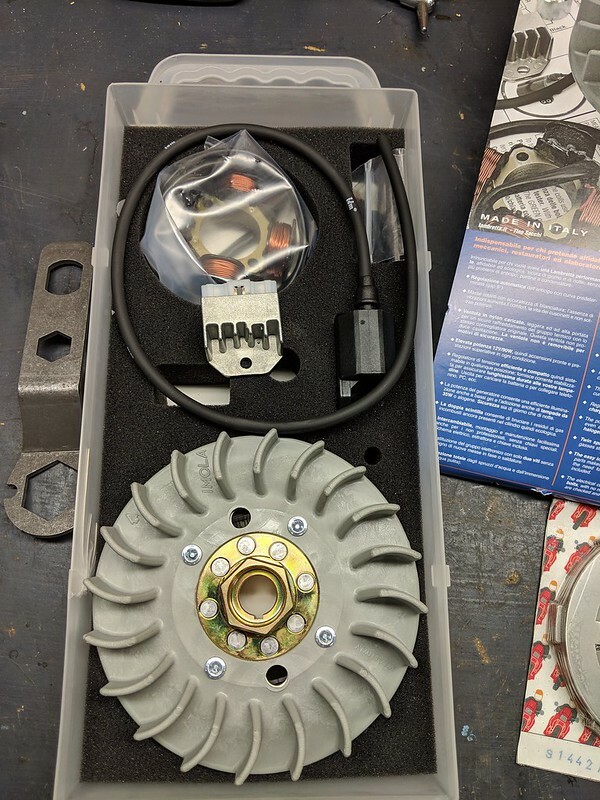 Also, I trusted Patrick to order these parts for me. 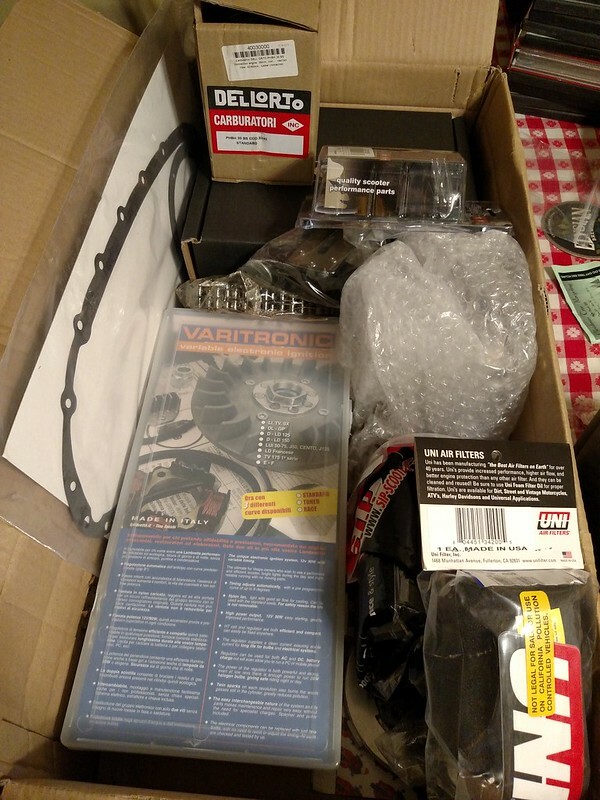 His network of trusted suppliers gave me peace of mind that my order would arrive and contain quality parts. The sleigh arrived a few weeks ago. Patrick is a really cool guy and his customer service is second to none. I really want to thank him for his help and guidance. I've been so busy lately, I've barely had time to even look at these parts. But I took pics of them last night, just to share here on LCUSA. I wish everyone a happy holiday season. Talk with you in 2019! Love and Peace for all. Here are some other pics of other stuff from the other. Nice good to hear it! Hey man, Long time since my last post. My Lami won't be ready for the spring scoot. Truth of the matter is that I met a great woman (in Dec.) and I've been spending all my spare time with her. So, I'll be sure to make some time for my scoot this year and I'll post my updates when they take place. Until then, I hope you all have a fun spring season and I'll be sure to plug in when and where I can. Where are you in Portland? I seem to have the only Lambretta in "the fashionable Southwest Hills". There are a few of us that live in the “fashionable Southwest Hills”.... and a few that live even further West. If your planning going of riding down the hill to Spring Scoot, let me know! I am in Bridlemile. Where are you? West slope aka 217/26 area. I'm located in outer SE Portland. Nice to meet you.